Every year, more and more motorcycles are on the roadways sharing the blacktop and enjoying the freedom of movement that comes with life on two wheels. Because of a motorcycle’s lack of protection, however, more and more injuries come with the decision to ride a bike. 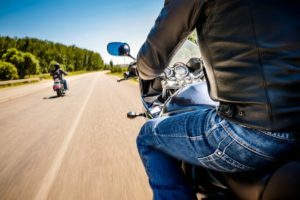 When you know the most common types of injuries associated with motorcycle accidents, you can make an effort to prevent them by wearing the right kind of protective gear and driving defensively. Head injuries – The most common and the most fatal, head injuries can be prevented if you buy a good helmet and wear it every time you ride, even if you’re only planning on being out for a few minutes. Road rash – When a rider slides across pavement after an accident or from purposefully ditching one’s bike to avoid an accident but is not wearing proper protective gear, road rash happens, which can lead to skin irritation, infections, and nerve damage if not treated immediately. Muscle damage – This seemingly simple type of injury can actually become permanent, so if you are in an accident, make sure you have your muscles examined and don’t forget to protect your eardrum, an easily-damaged muscle that is often overlooked. Biker’s arm – In an accident, we naturally extend our arms to try to prevent hitting something or wrap our arms around ourselves to lessen an impact on our body. This results in arms being broken and nerves and muscles being damaged. Wear a sturdy jacket with elbow pads to lessen the impact. If you or a loved one has been in a motorcycle accident, protect your rights by calling our experienced New York personal injury lawyer at Weiser & Associates today at (212) 213-3111 to schedule your consultation.